Rip-It Security Shredding and Recyclers is backed by company Directors who have experience and accredited training in the security industry. They know exactly what it takes to ensure your records are kept secure until they’re destroyed, and they know what total and permanent destruction really means. What Rip-It Security Shredding destroys can not be recovered. 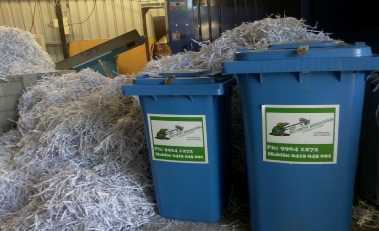 A Rip-It Security Shredding representative will discuss your specific requirements. Once we understand what needs to be destroyed, and how often, we will propose a tailored solution for you. If you simply need our services to deal with an isolated case of document destruction, and the quantity involved is small, you’re welcome to deliver the material to us. For larger volumes we’re happy to collect them from you. Many businesses have an ongoing requirement for our services. In these cases, we provide secure storage bins at your premises, with a key issued to the designated responsible employee. We call, collect and replace the containers at specified times and destruction occurs in our facilities. 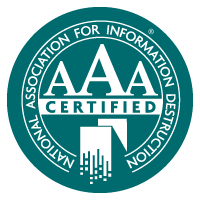 NAID is the international trade association for companies providing information destruction services. Rip-It Security Shredding & Recyclers is a member of the Association.